This morning’s assessment continues to show very little activity in the down slope areas. Activity upslope continues with numerous small breakouts within the flow pad as well as along both margins of the flow. These breakouts extend from an area approximately 8 miles upslope of the stalled flow fronts to the summit area of Pu’u O’o. All current activity does not pose an immediate threat to area communities. The Hawaii County Civil Defense Agency and Hawaiian Volcano Observatory are maintaining close observations of the flow and residents and businesses down slope will be informed of any changes in flow activity and advancement. Smoke conditions were very light with a light north wind blowing the smoke in a southeast direction. Very little burning activity was noted and there was a light rain in the area. Smoke conditions may increase in some areas and individuals who may be sensitive or have respiratory problems are advised to take necessary precautions and to remain indoors. Activity Summary: Three areas of breakouts in Kīlauea’s East Rift Zone, within 6 km (4 mi) of Puʻu ʻŌʻō, continue to be active. The lower part of the flow field near Pāhoa shows very little activity and Kīlauea continues to host a lava lake at its summit. June 27th Lava Flow Observations: Three areas of breakouts continue to be active in the upslope portion of the June 27th flow field, northeast of Puʻu ʻŌʻō: the northern flank of Puʻu ʻŌʻō (Feb. 21 breakout), near Puʻu Kahauale’a, and 5-6 km (3-4 mi) northeast of Puʻu ʻŌʻō. Scattered tree burning continues to be visible in webcam images from the furthest northeast breakout. Hawaii County Civil Defense reports very little activity in the downslope portion of the flow field, closest to Pāhoa. Puʻu ʻŌʻō Observations: No major changes to the Puʻu ʻŌʻō crater are visible on webcam images. 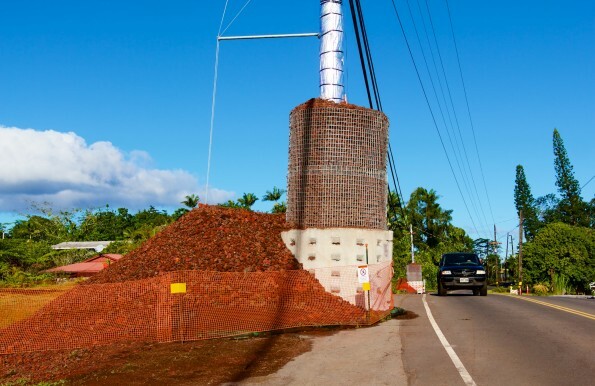 The tiltmeter on the north flank of Puʻu ʻŌʻō continues to show no significant motion. The sulfur dioxide emission rate from all East Rift Zone vents was about 430 tonnes per day when last measured on March 6. Summit Observations: After a brief period of deflationary tilt, tiltmeters at Kīlauea’s summit transitioned back to inflationary tilt, still consistent with the inflationary phase of a DI event. The summit lava lake level stayed steady, at about 50-55 m (165-180 ft) below the rim of the Overlook crater. Sulfur dioxide emission rates averaged 0-3000 tonnes/day for the week ending March 17. 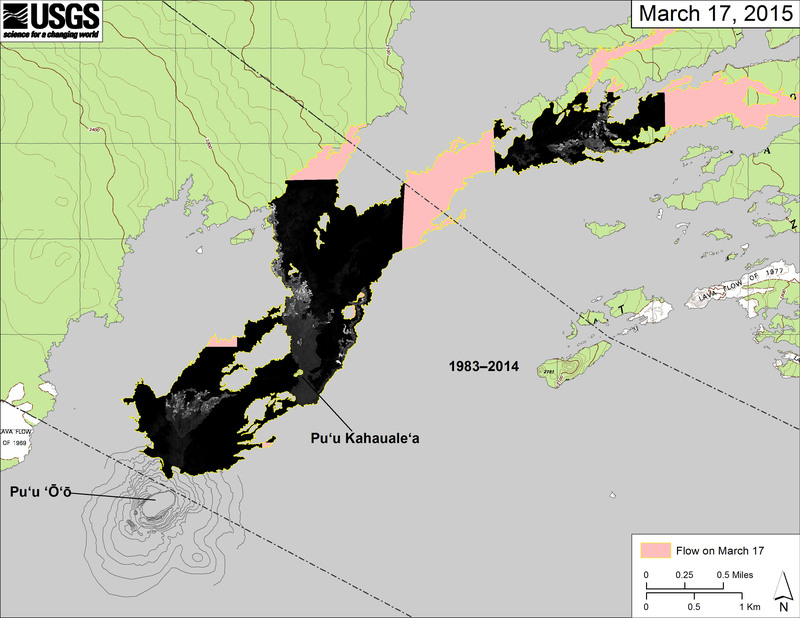 This map overlays georegistered mosaics of thermal images collected during a helicopter overflight of the three areas of breakouts near Puʻu ʻŌʻō on March 17 at about 8:00 AM. The perimeter of the flow at the time the imagery was acquired is outlined in yellow. Temperature in the thermal mosaics is displayed as gray-scale values, with the brightest pixels indicating the hottest areas (white areas are active breakouts).